LOCAL. FRESH. YEAR ROUND. SEASONAL. Here is a brief list of local fresh farmers markets in the New Jersey, New York, and Long Island metro areas. Complied are those that are open year round indoors as well as those that are seasonal and outdoors. Majority of these markets accept EBT and have very reasonable prices for fresh produce, so there is NO EXCUSE not to use fresh markets to your advantage. Ramsey Train Station Erie Plaza off Main St. Train Station Parking Lot, Godwin Ave. & W. Ridgewood Ave. 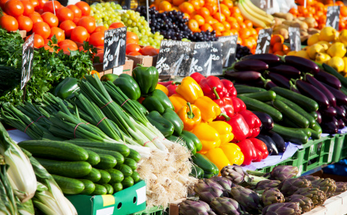 Please click here to find a local farmers market in your neighborhood. Interested in having fresh local produce filled meal kits delivered to your families? Inquire below for Bergen & Hudson Counties in New Jersey or New York (5 boroughs & Long Island). Let Body by Régine help you eat healthier and more conveniently! Learn more about our meal kit and home services today! Turmeric is actually apart of the ginger family and widely used in Asian and Indian cultures as well as medicinally. Benefits include anti-inflammatory agents, aiding with stomachaches, sprains, skin & eye infections, liver function, reduce risk of cancer, digestion, and general pain. Turmeric is high in manganese, iron, B6, vitamin C, potassium, and fiber. This spice has been said to be stronger than ibuprofen or aspirin. Next time you want to grab a pain reliever, try taking a couple teaspoons of turmeric instead, for a natural yet effective remedy. This can be made similar to tea, hot water or milk and you may add lemon and/or honey. Taking capsules daily may be sufficient, but make sure the ingredients are solely turmeric, many brands add other compounds while falsely advertising as 100% turmeric. This can be used in virtually any fish, soup, smoothie, teas, and sauces. One of my absolute favorites! Many medicinal uses, but great for cooking too! The ginger root plant offers a spicy yet tangy sweet taste, often providing ethic foods with their world-renowned flavors and aromas. Ginger has numerous healing properties that aid in relieving flatulence, nausea, stomachaches, congestion, colds & sore throats, colic, migraines, and IBS (irritable bowel syndrome) symptoms. Also increases blood circulation and reduces inflammation. Excellent source of B6, magnesium, niacin, folate, zinc, phosphorus, and riboflavin. Ginger is very easy to consume, although very spicy, you can easily peel and slice small pieces to eat raw. 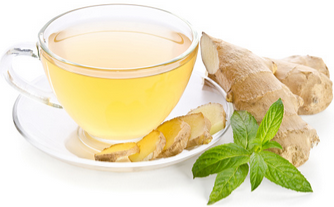 Making tea from ginger is very beneficial and infusing in water has proven to be quite effective too! Lemon ginger water is amazing! I highly suggest you try it if you haven't! Using cuts of this powerful root in dishes like stir-fry makes nicely aromatic meals with fresh vegetables and a well paired protein and carbohydrate. You probably think cinnamon is a seasonal spice, but in fact you should be using it year round for its health benefits. Great source of antioxidants! Consuming teaspoons of this spice can go a long way! Cinnamon is known to prevent heart disease, diabetes, even cancers and neurodegenerative diseases in addition to maintaining blood sugar levels, digestion, enhancing immune responses, remedy for pain (i.e. menstrual pains, muscle soreness), and heart health. 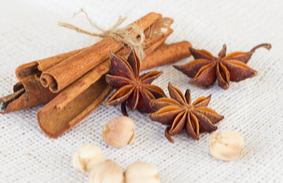 Great source of calcium and potassium, smaller amounts of phosphorus, iron, vitamin A & vitamin C.
Cinnamon is another spice that is very versatile. Sprinkling in the form of powder is a primary use, although cinnamon sticks are rather popular as well. Cinnamon tea, consisting of hot water and cinnamon bark is an old remedy to treat nausea. Adding to meats as seasoning or simple vegetables or fruit can really change up the flavor to create a new exciting recipe. Try hot milk with honey, vanilla, and cinnamon for an exotic yet simple warm beverage without caffeine and also perfect for the kids! Did you know black pepper may be the most well known and accepted spice worldwide? Who doesn't like fresh ground black pepper?! I'll admit it's one of my favorites and well, I do put it on most foods. Black pepper is used frequently, but to maximize its health benefits, it's best to grind whole peppercorns immediately before consuming on foods. This also enhances you body's absorption abilities of other nutrients from foods. The peppercorn aids in digestion while promoting intestinal health and disables the formation of gas, but also promotes fat loss by breaking down fat cells. Black pepper is a terrific source of fiber, vitamin K, C, & B6, manganese, copper, iron, chromium, and calcium. 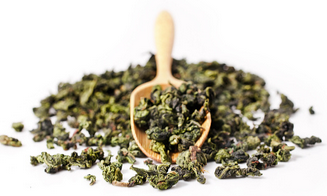 In other words, full of antioxidant promoting properties! Black pepper can be used with absolutely everything, from seasoning your favorite dishes, to relieving tooth aches, or surprisingly enough as a skin exfoliator! You may even take 1/4 tsp of freshly ground pepper with 1 tsp of tumeric daily to maximize your body's absorption rate. Everyone knows paprika, but aside from sprinkling this spice on deviled eggs or decorating a dish, I bet you're unaware of the benefits it actually holds. Being rich in carotenoids, that provide antioxidant properties and capsaicin, which minimizes severe chronic illness, as well as acting as an appetite suppressant only begins to address the health benefits. Paprika packs a large dose of antioxidants in such a small serving, it's believed to treat and prevent cancer, beneficial to the eyes and heart, plus the antioxidant quality may relieve symptoms from autoimmune disorders. This vibrant red-orange spice may also be a great substitute for salt; sometimes when you think a food is lacking salt, it's really missing flavor, a flavor paprika can certainly provide! Such a great alternative! Seeing as though paprika is derived from bell peppers, the spice provides excellent sources of vitamin A, C, K, B6, & E, thiamine, phosphorus, manganese, cooper, fiber, niacin, iron, potassium, and lastly riboflavin. Aside from garnishing as a seasoning, paprika can be used in facial masks and added to hair dyes to enhance and balance color. Adding the spice to foods and beverages give the most benefits though due to consuming, allowing maximum absorption rate. Paprika works the best from the inside out! 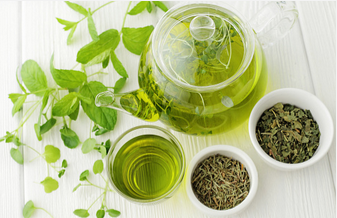 Did you know...many ailments, chronic illnesses, and even simple pains or sicknesses we temporarily have can be treated holistically, with every day foods and teas? I've complied a lengthy, yet beneficial list of what you should consume rather than throwing back an Advil or other medicine that isn't necessarily beneficial to the body. Ibuprofen can actually make inflammation worse, so why not use holistic means of healing if it's completely natural and works wonders?! 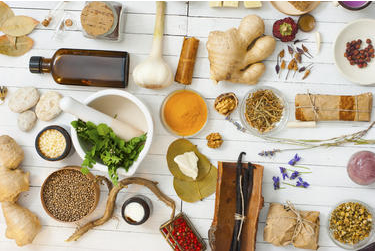 Stock up on these natural medicines now! How healthy is your furry family member? 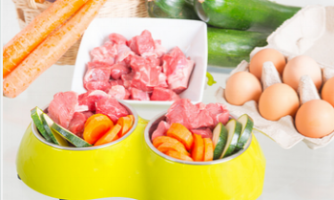 Have you ever thought of implementing fresh foods to your pets diet? We humans typically attempt to lie healthier by choosing what we eat and how active we are, although with any animal as a pet, they depend on us to make the right choices for them and provide them with food, while also regulating their activity levels. Introducing a healthier lifestyle for our fur babies is essential! I will cover benefits that follow such a lifestyle including simple tips and suggestions to get your litter guy(s) and/or girl(s) the optimum healthy lifestyle! Fresh organic foods aren't just good for you, but they provide many health benefits for our pets too. Produce is usually easier and more accepted by dogs. Produce is low in calories. Portions should of course be regulated; snack size is the rule of thumb, based on their body size and weight. 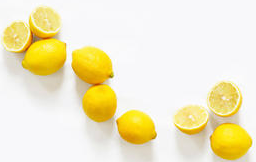 Fruits and vegetables can be consumed raw, but for easier digestion, steaming or sautéing is suggested. Several foods to choose, range from green leafy vegetables like spinach, beans, string beans, pods, crunchy fruits and vegetables. String beans and bean pods aid with blood cholesterol and glucose levels. 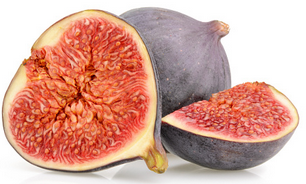 Great source of fiber and good for heart health with antioxidants, vitamin B6, and folic acid. Broccoli is also a great addition, with its cancer fighting and immune system building compounds indole-3-carbinol and sulforaphane. These promote ideal hormones to control cancer reproduction and enzymes to thus prevent cancer from even forming. 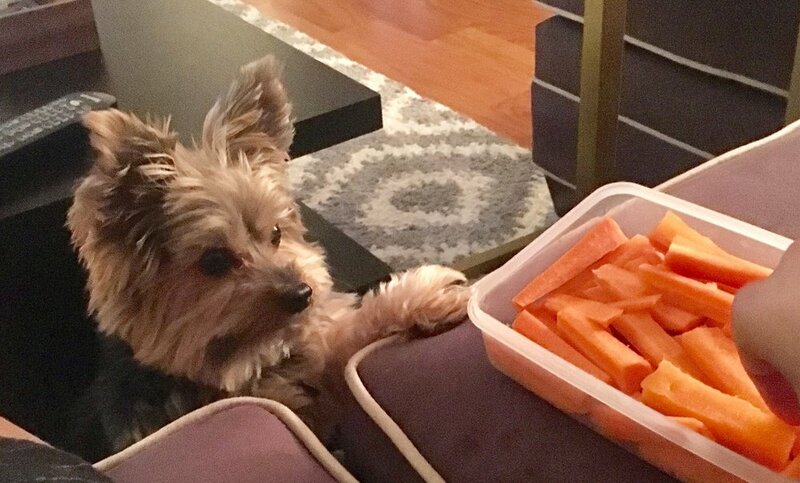 Now one of Coco's favorite snacks is carrots! You can chop carrots into pieces, the size again depends on your dogs size. I personally chop Coco's into small fine chunks because he sometimes doesn't chew things and he's tiny! Little pieces for our little pups and larger cuts for the big boys! 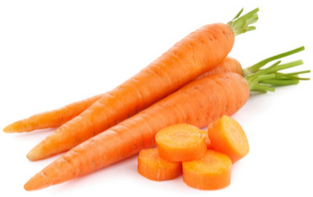 Carrots help fight heart disease and reduce the risk too. Falcarinol, a cancer preventing compound is present along with beta-carotene which also promotes healthy eye sight and includes antioxidant properties to help fight free radical cell damage. Now one of Coco's favorite snacks is carrots! You can chop carrots into pieces, the size again depends on your dogs size. I personally chop Coco's into small fine chunks because he sometimes doesn't chew things and he's tiny! Little pieces for our little pups and larger cuts for the big boys! Carrots help fight heart disease and reduce the risk too. Falcarinol, a cancer preventing compound is present along with beta-carotene which also promotes healthy eye sight and includes antioxidant properties to help fight free radical cell damage. Another great source of antioxidants can be found in green leafy vegetables. They can help to prevent cell damage, which in turn is a preventative for cancer and inflammatory diseases i.e. arthritis. Sometimes our fur babies will enjoy greens raw, but again, being sautéed or steamed is more appealing and easier to digest. Fresh foods can definitely enhance your pets diet to fulfill the healthiest lifestyle, but I will now share some essential foods to help with their teeth too! 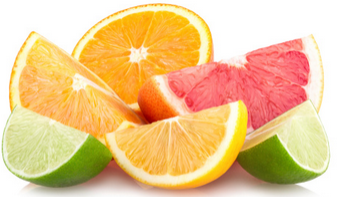 Using crunchy vegetables and fruits can drastically reduce plaque and clean gums naturally, without added sugar. Many treats on the market for teeth cleaning are full of sugar and additives, so using apples, celery, broccoli, and carrots is ideal! These help rid buildup and plaque on teeth. Jerky is great as well, but it must be 100% meat. The rough texture helps immensely! Raw bones are a go-to, very similar to fruits and vegetables, although they provide nutrition like bone marrow adding calcium. This restores and rebuilds teeth strength. Be aware of sugar or sweeteners added and cracked bones! If swallowed, the bone fragment can block their gastrointestinal track and cause punctures in the stomach and gastrointestinal lining. Although our fur babies can eat many of our human foods, it's pertinent to know the do's and don'ts. I've listed foods that should be avoided below. Prevent any consumption of the following to ensure they live long healthy happy lives! Our pets count on us to provide them with the ultimate healthy lifestyle. March/Early Spring: 'Tis the Season for Produce! It's that time again! More new in season fresh produce! Now that winter is coming to an end you will notice with each month becoming warmer, more produce will become available. 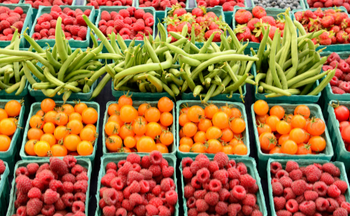 Have you noticed a difference at your local farmers market? As I mentioned in last months 'Tis the Season for Produce, were you able to see how many grocery stores and even some farmers markets provide out of season produce? Again, eating in season is not only a healthy eating habit for you and your family, but also helps to preserve our cultural diversity. Harvesting what we have at the moment is key. In order to conserve our produce and all food worldwide, we must adhere to food seasonality. Depleting soils of their much needed nutrients or not harvesting naturally is detrimental to our well being as well as Mother Earth. I've noted March's new produce additions below for you to become more familiar with our upcoming spring availability. Stay seasonal my friends! Herb. Part of the allium family. 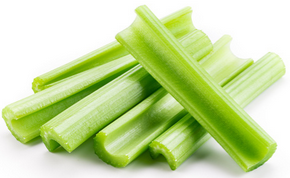 High in vitamin A, C, K, great protein source, calcium, & folate. Contains allicin that helps to control blood pressure/cholesterol and quercetin that has an antioxidant complex used to combat disease. Uses: Seasoning foods, garnishing, salads, soups, omelettes prior to serving, but best used raw, limit cooking due to its delicate nature. Herb. Resembles oversized mint leaf. Good course of vitamin A, K, calcium, iron, potassium, magnesium, fiber, & protein. 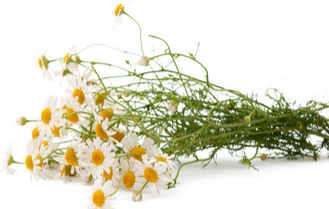 Medicinally used for detoxifying & anti-inflammatory i.e. gout, anemia, joint pain. 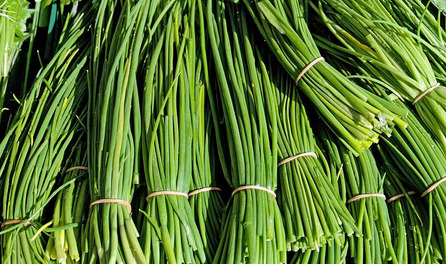 Storage: Very perishable, refrigerate for a few days, can blanch & prep for freezing. Herb. 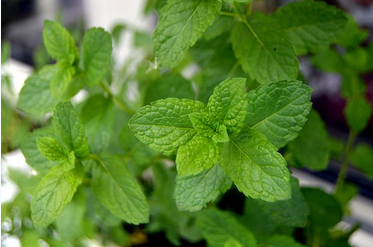 Various forms of mint produces like spearmint & peppermint are mostly used for cooking. High in vitamin A, C, iron, manganese, folate, & calcium. Uses: Not cooked, garnish, raw, mix in salads, press in meats to season, creamed, muddled, steeping. Vegetable. 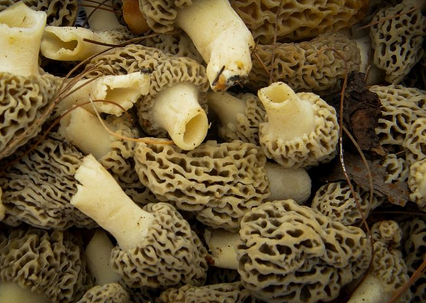 Wild Mushroom variety with honeycomb texture. Yellow, black, & white color. Similar to truffles. Decent amount of iron and lesser amounts of vitamin D & B. Contain toxin, hydrazine, never eat raw! Once cooked, the toxins are removed. Can also interact with alcohol negatively causing stomachache, loss of muscle control, and heightened intoxication. Store: In paper bag, don't clean/wash until ready to use. Freeze or dehydrate to store too. Vegetable. Peppery taste resembling onion & garlic. High in vitamin A, C.
Medicinally said to prevent or fight cancer, due to the selenium. Store: In wet paper towel & plastic bag, or freeze. Lasts 3-4 days. Vegetable. Edible fungus, many varieties. 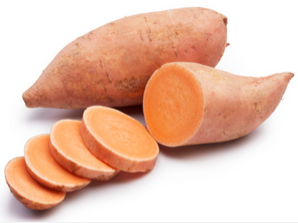 High in vitamin B2, niacin/B3, B5, and minerals like copper, selenium, phosphorous, & potassium, iron and some protein. Medicinal benefits for immune system & cholesterol. 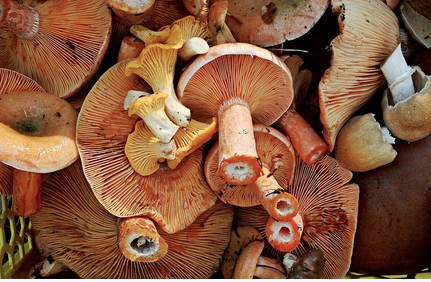 Contains smal amounts of agaritine, which can turn into carcinogenic compounds, to prevent this cooking mushrooms is recommended. Uses: Raw, sauteéd sliced in salads, cooked in risotto or rice, side dish, soups or any type of dish. Let's not forget about some of the other produce from the last seasonal produce blog that are still in season too! Organic, the word we hear time and time again, but did you know in its truest form, organic means carbon? Yes, carbon. As a science person, it's often a joke among chemists and biologists or anyone who has a background in the sciences. Nowadays, organic is used to label and/or describe the purest form of our foods. Whether it be farmers markets, grocery stores, or even restaurants, you're bound to see that word. Although, did you know, organic isn't always better? This word can be quite misleading, yet most individuals are clueless and don't understand the complexity that lies behind this recommended grade of food. The United States Department of Agriculture, known as the USDA, and the National Organic Program regulate our foods along with all means of agriculture and farming. Typically you'll find their official seal for certified organic quality on food items deemed organic. Without such a seal, it's highly likely an item isn't actually organic. Now you've heard of and seen the term just about everywhere with the current organic craze, but you probably don't know much about the concept. For starters you're familiar with the terms organic, natural, and non-organic right? Well I'll tell you this, each one is very different than the next. Organic and natural are not the same thing, nor are they comparable by any means! Organic follows specific guidelines whereas natural does not. Natural is said to be minimally processed, yet there aren't any regulations or guarantees . The term "made with organic ingredients" also does not constitute a product to be organic. This generally means 70%-94% may contain organic ingredients, which is a rather large percentage spectrum. Here we go! Organic is fairly complex as previously mentioned, but I will break it down for you so it is relatively easy to understand. Once the basics are grasped, you'll be able to make more educated decisions when it comes to food grade quality when shopping and consuming produce, fish, meat, poultry, and other food items. To be considered organic it must be certified by the USDA with their organic seal. The item must contain at least 95%-99% organic ingredients, while the remaining 4%-1% ingredients aren't available as organic or are chosen to be non-organic, but still are approved by the NOP (National Organic Program). This all means, organic constitutes grown without any synthetic pesticides or fertilizers or involve GMOs (genetically modified organisms) within that 95%-99% frame. There isn't just a single type of organic, but various grades. As mentioned, the grades vary, you have 100% organic, 95% organic, made with organic ingredients made with at least 70%, and specific organic ingredients less than 70%. How often do you eat organic? Now before answering, you may want to double check if what you believe to be organic truly is certified organic and just how organic is it! Checkout your local grocery store or farmers market to see the labels used or items labeled improperly as false advertising. Restaurants may also use improper labeling of entries too, thus reading the fine print is key! Many items will say "organic", but in very fine print it will state it is in fact not 100% organic. I recently bought a new tea, a green tea with infused coconut, it just so happened to be organic. As I'm checking out the box, I realize in tiny print that 5% is non-organic, but may only be non-organic due to its lack of availability. It isn't specified, but the unknown makes you wonder. A company may try cutting costs by not being 100% organic. Even if organic ingredients are available, they may choose not to use it for cost reasons, not necessarily because it's unavailable. Just some food for thought! Now you know the facts about the organic lifestyle and maybe you'll rethink eating organic or at least the grade you desire. Be aware of the foods you eat and as always, stay in the know! "Isn't there a reason why I stay away from soy?" the question you probably ask yourself more times than not. Generally speaking, most are aware there are some negatives in regards to high consumption of this legume, but don't necessarily know why. Personally, having severe food allergies has given me the opportunity to become rather experienced and well-learned when it comes to soy. Back in the day, the only milk alternative was soy, but thankfully there are now countless dairy and protein product alternatives available. These substitutes range from coconut, almond, and cashew, all nut based to rice, hemp, and additional plant based foods. The soy bean itself carries several disadvantages that should be avoided, most importantly because you're unknowingly already consuming soy in everyday foods. Take a look at the ingredients for any food product you own and nine times out of ten, the food label will list soy or a soy byproduct. 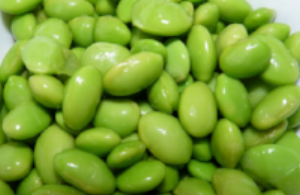 For starters, soy has high levels of goitrogens, compounds known to inhibit and disrupt thyroid functioning. The body is unable to process iodine properly and can lead to hypothyroidism or related issues of a slower thyroid. For those unfamiliar with the thyroid, this gland controls hormones that regulate your body's metabolism. Having any dysfunction of the thyroid or its gland will disrupt its functioning. Maintaining a proper balance is essential for the body. Other foods of course have the similar high levels of goitrogens, like cruciferous vegetables, once cooked the negative effects diminish, yet with soy they remain. The promotion of estrogen is one of the soybeans attributes which is likely to cause development and growth of cancerous agents in some cases. The genes effected can easily be inititated to produce mutation, the beginning stages of a cancerous growth. With the presence of isoflavones, estrogen activity is thus increased. You may think estrogen is harmless, but it is quite the contrary. Estrogen acts differently in males and females. Both can gain fat around the midsection, this can promote diabetes. Men will lack energy and libido, gain fat or accumulate breast tissue causing a swelling breast shape, resembling a female, known as gynecomastia. Women having elevated levels of estrogen develop a hormones imbalance, in turn causing menstruation issues and thus fertility problems, along with a greater risk of breast cancer. Even newborns can be affected due to heightened soy intake. Higher amounts of estrogen can cause failure in male infants to fully develop proper or adequate testosterone levels. To put it into perspective, it's been said, certain estrogen producing soy products like formula can be equivalent to consuming up to five contraceptive pills daily! Wow! Many formulas are soy based, so please read labels thoroughly! Soy also contains trypsin inhibitor, a type of protease inhibitor. For those who aren't science obsessed like myself, this toxin basically causes the blockage of enzymes to reach soy in order to digest this protein properly. With such an effect on digestion, soy often causes bloating, indigestion, bowel issues (constipation or diarrhea), and gas. As with any indigestion, additional health complications may arise. Now, as a crop, the soy bean is destroying our planet more so than the human body. Believe it or not, the idea of eating plant based isn't necessarily the best for the human body or Mother Earth. 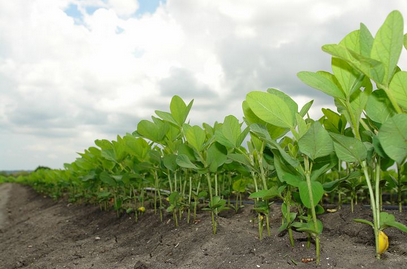 Planting soy is very destructive in the sense that when harvested, soy takes irreplaceable nutrients from the soil while also being one of the most genetically modified crops today. Soy is even injected into meats, mostly in factory settings. Know where your food is coming from! There are several large producers of soy, who sue other farmers and producers from producing and harvesting soy properly, so the majority of soy out there is of GMO crop sources. The large scale companies desire mass production and drive profits by cutting corners and dominating an industry, not by harvesting ethically. I can imagine this must be news to you, although the truth is now clear as day. 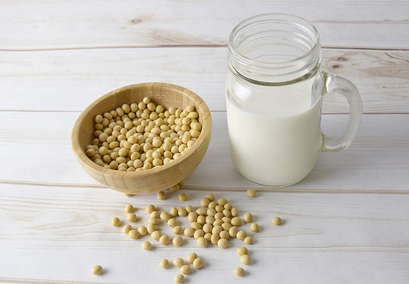 Overall, soy should be used minimally and NOT as a primary protein source. Like any other source, a well balanced diet is in order. Here's the dish on the fish! I'm sure you've heard of and have even consumed the infamous tilapia fish, but I bet you don't know how unhealthy it truly is! Having eaten this fish, or lack there of, for 9 months straight when I competed as an athlete in my younger days, I gained a great deal of knowledge of tilapia. Consumers do not know the reality behind tilapia and more shockingly it's falsity of being a healthier alternative for meals. Did you know tilapia technically isn't a real fish? Are you familiar with the term 'genetically engineered'? Well there you have it! I will thoroughly break this down for you, but I can promise, after reading these cold hard facts you will NEVER eat this so called fish again. Stay in the know, stay informed, and more importantly know where your food comes from and what the breeding and/or harvesting process consists of. Did you know you cannot find tilapia in the wild? Tilapia is a farm raised genetically engineered fish, meaning man has created the fish and its environment. Many fisheries who supply grocery stores and fish markets aren't what you'd believe them to be either. The prison systems are in business to not only house criminals, but also drive revenue. You're asking yourself, how does this relate to tilapia right? Those fisheries that supply your food markets are located and sourced within prisons. Yes, its highly likely inmates are breeding that fish you're planning to prepare for dinner. Although this may seem like the worst case scenario, I can assure you it is not. 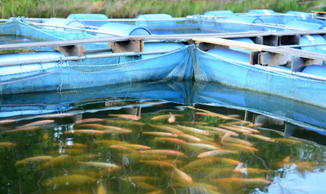 The term "responsibly farm raised" can hold value to a food, but with tilapia you're taking a chance regardless, due to the lack of a natural sourced breed of fish. Tilapia is the worst of fish because of this, but other species like that of red snapper and salmon are too, being replaced and often imitated by tilapia. I'm baffled by this and utterly disgusted that tilapia is not truly a fish, yet it is being portrayed as one and a healthy food as well. This merely exemplifies the great decline in our food sourcing and quality worldwide. In addition, restaurants in many cases aren't aware of the source for the food they sell or what the breeding to consumption process entails. As I write this entry I cringe, but I will continue to explain because my mission is to educate others to live a healthier life. Informing those who do not know is a priority, always, especially with tilapia because of the unhealthy craze. Typically tilapia is sold everywhere and for peanuts. As a consumer we think less expensive, white, low fat fish, this is healthy right? You couldn't be further from the truth! Tilapia isn't considered a bottom feeder, but they can and will eat anything. As a breeder or farmer, cutting costs is the goal to maximize profit. With this, tilapia are generally fed chicken and/or pig feces as their diet. Now let that digest. That is not all! Tilapia more times than none are left to breed in over crowded environments causing more issues while being exposed to genetic modification and antibiotics. The idea of eating fish in general is typically for nutrients, yet tilapia really lacks any nutrient values. Having low omega 3 fatty acids (good fats) and high omega 6 fatty acids (bad fats) alone make it a no-brainer. 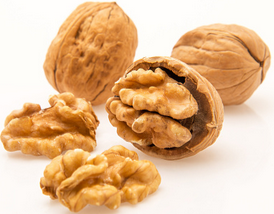 One of the 6 omega fatty acids, arachidonic, has been linked to Alzheimer's Disease. The risk of cancer heightens as well from consuming this creature; being up to 10x more likely to carry carcinogens because of the farm raised approach and what they're fed. Now for someone like myself who consumed this years ago without prior knowledge to the negatives, I was alarmed by this last fact. The toxic chemical compound dioxin, is found in tilapia, meaning once consumed dioxin enters the body and takes years to clear from the system, leading to the possibility of long term damage. Over the years I've purchased fish from every chain supermarket and many independent fish markets, but I've come to learn first Whole Foods and second Trader Joe's are best among grocery stores and ultimately my go to sources for fish. It's always best to go directly to a fish market or fishery when purchasing fish, but when you don't have the resource, those two stores have excellent ratings and you're able to track and know the origin location and process your fish has endured. I also suggest checking out local markets that have vendors like local fisheries who sell directly from their seasonal catch in neighboring waters, that way you know it's local and wild caught. Do your research even outside of the fish industry, you should know where ALL of your food or anything you consume for that matter originates and the entire process from breeding to consumption. Does your family have a picky eater? Growing up, I was lucky to have been a serious child; I say this because of my dietary intake with a severe food allergy and how I live now at the age of 30. You're thinking, what a strange thing to say, right? I promise you'll understand shortly! Way back when, around 7 years old, I remember being told doctors had never experienced the severity of my allergy to lactose and milk protein. Little did I know how life altering that would be! I always knew something was off, but never thought that would've been it! So growing up with my mom being a chef, everything was homemade and healthy, my eating habits although not the norm, became increasing healthier. I've always loved fruits and vegetables, enjoyed delicacies, but what are the odds of a child genuinely enjoying escargot or liver pate? You said it, very slim! Spending time with my Nonnie, 80 something year old grandmother, also rubbed off on me. Whichever the case, I was once a very rare bred child, but thankfully today's children have access to a multitude of alternatives and healthy food items, yet parents still seem to struggle with children adapting to healthier food acceptance. I have made it my mission to not only help end childhood obesity, but I will strive to educate parents on how to make eating healthier fun and enjoyable for their children and the entire family. Did you know children are exposed to taste as early as in the womb? Taste and smell are actually transmitted via amniotic fluid. Even the learned preferences in pregnancy and early childhood influence adulthood which in turn shows a direct relationship between our dietary intake and flavor programming. How your child perceives food, begins with what you as a parent consume while carrying. During infancy and early adolescence sensory acceptance learning is highest, so you'll want to introduce new healthy foods regularly. Once a child's palate has developed, the probability of he or she leading a healthier lifestyle for a lifetime is rather high. Children in general are born into a society that predisposes them to the unhealthy habit of overeating. The more exposure a child is given to new foods, the better conditioned they'll be to accepting new things. Always encourage healthy eating! Limit exposure to processed foods, but increase exposure to farmers markets and introduce gardening as a fun new activity. A small kitchen garden not only provides fresh produce, but also involves little ones and encourages them to eat fresh produce! Participating to grow, harvest, and cook plants they've grown themselves creates excitement while increasing the willingness to eat healthier too! Exposing children visually to produce also sparks great interest in healthier choices. 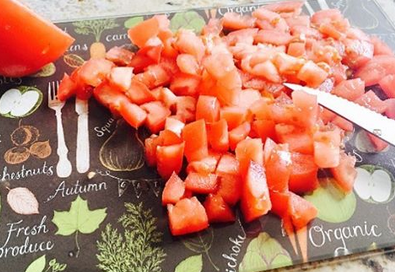 Allow your child to help prepare meals to have the sense of ownership toward foods. Rather than bombarding children with an entirely new item or taste, use a familiar flavor or ingredient with one or two new foods or tastes to increase the likelihood of acceptance. Giving our little ones choices is always best! For this reason alone, don't combine or mix foods so they're able to pick and choose themselves. For meals, sit down with children as a family to create the best atmosphere socially and educationally. Have a positive demeanor and reaction to healthier foods like fruits and vegetables you want your children to eat. The type of parent and peer role modeling have been proven to increase a child's willingness to eat new different foods. Make healthier food options readily available, cut fruit up, prepare vegetables as ready to eat for easy grab and go access. Hiding vegetables in foods like smoothies or baked goods is less than ideal for long term, but it does help with younger stubborn children until they begin to accept the real deal. There is a very strong link between cooking and nature. The idea of eating foods that grow locally and naturally will create the ideal cycle from harvesting to consumption. If we can successfully teach our little ones the basics of eating better and making healthier choices we will have created an optimum design of wellness for life. So you ask, what are the takeaways from this? 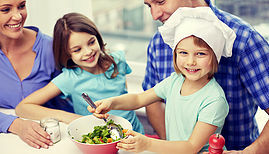 -Have children more involved with cooking, visits to farmers markets, & allow them to chose healthier foods themselves. -Let children participate, as easy as mixing foods together. -Surround & expose children to positive role models; if you eat healthy, your child will follow. Set the example! -Eat together, for every meal have sit down family time. -Include fresh cut up fruits and/or vegetables in lunch boxes daily. -Grow a garden; grow, pick, use harvested food to cook. -Fruits often work better than vegetables with children, clearly because of the appeasing sweetness. How Clean is the Produce You Eat & Prepare for Your Family? So you ask, what's the deal with white vinegar and why is it such a beneficial cleansing tool? White vinegar is most acidic among the various types of vinegar, making it an efficient cleansing agent. Due to its potent acidity, white vinegar can clean the most difficult build ups, including counter-tops (excluding natural & unsealed granite/marble stones), mirrors, wood, and even stubborn red wine and grass stained clothing! Not to mention, if you have a rebellious fur baby this holistic solution can rid urine stains and smells, while keeping our four legged friends from returning. Place the hydrogen peroxide in one spray bottle. Place the white vinegar in the second spray bottle. First spray surface with the white vinegar, then spray surface with the hydrogen peroxide. Rinse with water, then let surface dry. *Kills E. Coli, Listeria, & Salmonella. Most of us rely on farmers markets and grocery stores to supply our produce, yet have you ever wondered how clean your fruits and vegetables may truly be? You may put your trust into organic produce, although organic doesn't always mean cleaner. Among harvesting and arriving at your home, fruits and vegetables are highly susceptible to a rough and unsanitary journey. Seeing as though much produce is porous, white vinegar is safest to use for cleansing. Often chemicals can seep into the pores of fruits and vegetables, meaning harsh residues will be consumed if using a chemical cleaning solution. Rather than adding to the already present potential toxic chemicals, vegetable wash can definitely reduce and eliminate pesticides in addition to dirt and bacteria. Place & mix all 3 ingredients in bottle. Shake well. Apply to produce & rinse. Combine all contents in a bowl. Place greens in bowl. Allow them to soak for 2 minutes. Rinse. 'Tis the Season for Produce! January has passed and now February is here, and like most of us we use the first month of the year to become healthier. You check out your grocery stores, even farmers markets, and grab a basket full of fresh fruits and vegetables, but unknowingly you're not asking yourself a pertinent question--is this fruit or vegetable actually in season? Now you're pondering why would such a thing matter, right? Eating food based on local seasoned availability is the overlooked instrument that has the potential to fix our broken food system. Health & Sustainability Potential: two primary components to be heavily considered in this scenario. Tailoring our food consumption toward regional conditions will in turn preserve our cultural diversity and thus eating habits. Harvesting what naturally grows in their designated season has the potential to improve health while maintaining an environmentally friendly presence. Produce can be collected for free or in systematic gatherings and distributions. Having the accessibility and availability of foods locally, increases the safety of what we consume and sustains our environment. This may seem rather complex, but believe it or not, this process is quite easy to live. I'll tell you how! The sustainability of your dietary intake is based upon a life cycle assessment, everything we consume experiences this. We use such a method to assess any and all environmental impacts associated with all stages of an items lifespan. The life cycle of agricultural production is a long process to say the least. Here goes! Any piece of produce begins in its rawest form, followed by processing, packaging & distribution, storage, shipping, and additional storage. We then as consumers cook, eat, and drink forming food waste and disposal resulting with incineration. Now that is certainly lengthy, but thankfully as consumers we only experience a couple segments of any life cycle. Again, why does any of this matter? The purpose of the life cycle assessment is to compare the full spectrum of environmental effects of not only the produce, but also the service it endures. The process is constantly being reevaluated for improvement. The further out of their natural element a product is, the less healthy, sustainable, and safe it becomes. A great example is a peach. The season begins in May, meaning if you see a peach prior, it has not been grown and harvested in the best or natural environment or under proper conditions and may be genetically modified. Out of season creates the unknown ranging from depletion of soil nutrients, causing the product to lack nutrients and ultimately causing damage to our environment. Proactively choosing your diet intake will indefinitely affect your health and the environment, so why not eat seasonally and as local as possible? The next time you step foot into a produce market take the time to see what's local and seasonal. You'll be amazed! You can bet your pretty penny something is present that should NOT be due to seasonality! January-March for the New Jersey & New York Metro areas. Brassica oleracea family. Frost resistant (available 3 seasons). Widely uses pesticide organophosphate, make sure it's rinsed thoroughly and buy organic to ensure. 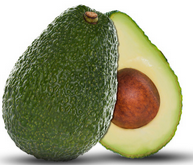 Anti-inflammatory: omega-3 fatty acids, vitamin K, C, E, flavonoids. High in vitamin C, folate, potassium, calcium, manganese, fiber. Uses: Do not cook; Sauces, Mix in Condiments, Seafood, Vegetables. Add vinegar to preserve for weeks or freeze. High in vitamin C, K, folate, manganese, phosphorous, iron. Alfalfa being resistant to weedkillers has caused generic modification & cross contamination due to pollination practices. Diabetic friendly due to minimally affecting blood sugar with its insulin carbohydrate component. Low calorie, similar to potatoes. Woody root vegetable. Said to have an oyster, carrot, parsnip, potato taste. Light brown/blackish skin with white interior. Turns quickly, root should be strong without blemish. Fibrous, high in vitamin C, B6, folate, potassium, manganese. 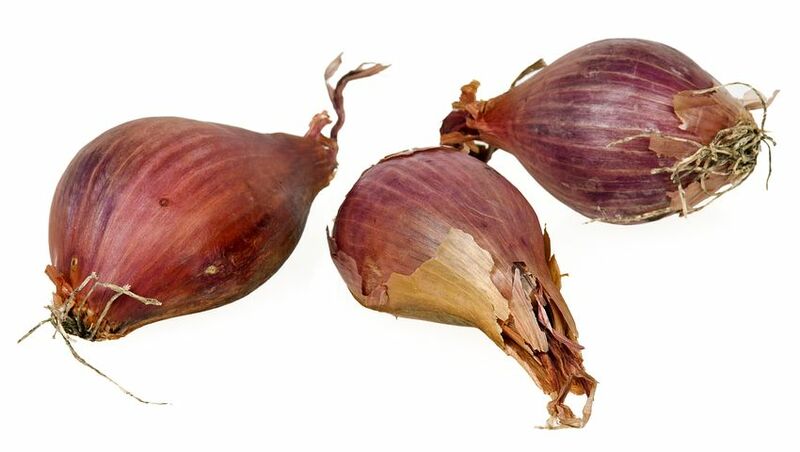 Allium onion family. Mild sweet taste. Usually imported from overseas, so try to buy local. High in vitamin A, C, B6, folate, potassium, manganese, calcium, iron. If stored in a cool dry dark place, last up to a month. Refrigerator storage up to 2 weeks.